Render Cleaning using the best techniques is our speciality. Cleaning coloured render needs to be undertaken carefully due to its fragility. Modern Pre-coloured render is a low maintenance finish which does away with the cost of regular painting. However periodic cleaning is required to keep the surface free from algae, bacteria, fungi, moss and lichen. These biological growths can cause unsightly black, red and green staining. The acidic waste products and root systems of these can also degrade the rendered surface. Great care needs to be taken with this delicate surface as it can easily be damaged by high pressure and commonly used harsh chemicals. 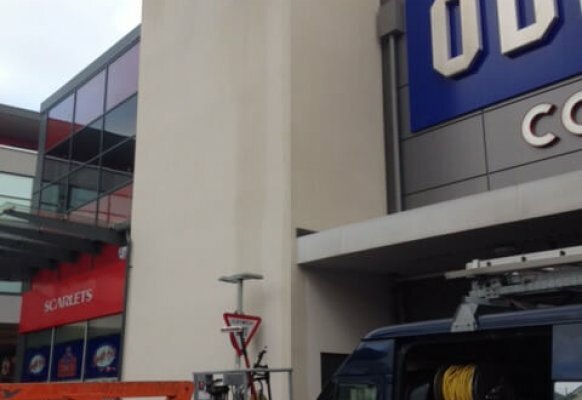 We have Specialist low-pressure render cleaning machines that allow us to gently clean away any contaminants. We use certified biocide products that are recommended by the render manufacturers to treat the render giving a very long lasting clean. We can also apply protective breathable coatings to many rendered surfaces. Our cleaning methods and treatments will not invalidate the manufacturer’s warranties. Most of the dirt and staining that you see on your render is caused by biological growth, basically stuff growing on it. Usually the first thing you may notice is some Green Algae, later on you may get black staining, this is caused by the Gloecapsa Magma fungus which is extremely common. Some areas also have the Trentepohlia species of algae that causes red coloured staining to render. So it is not caused by anything “bleeding” through the render but is caused by growth upon it. If the render is not cleaned for a very long time Lichen and moss can also be found growing upon it. 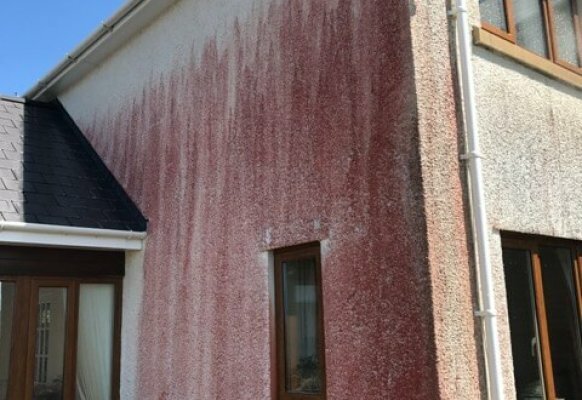 At this point it is urgent to clean the render as these growths can be very damaging to the surface as they literally eat away at it and secrete acidic waste products which further degrade the surface. When moss is cleaned away from render it often leaves an indentation. 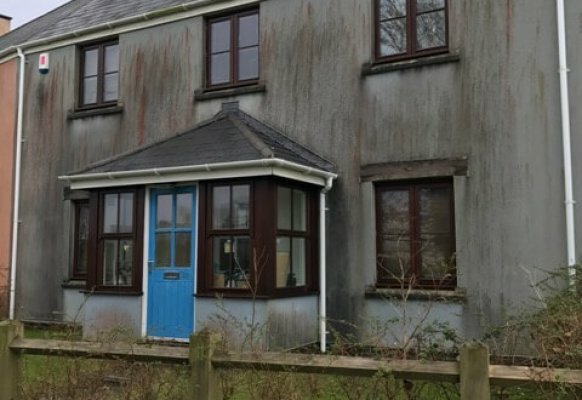 After an initial deep clean of the render to remove the Black, green and red staining and to clear away any moss or Lichen, it is possible to treat the render every few years to stop the growth coming back. This is by far the most cost effective way of keeping your render looking good permanently. Should I paint or Seal my render? Any type of coloured silicone render is not designed to be painted as the colour is all the way through the render. It is designed to last like this without the need for any painting. Because the surface is pourus if it is painted with a normal Masonry paint the finish is likely to fail and the paint will crack and flake off. The render is then basically ruined with very few options to rectify the problem. Sealing the breathable rendered surface with paint will trap damp behind the surface and can cause damp problems within the property. If you want to paint your render for some reason, for example if there are large areas of damage or you want to change the colour, then it is important to use the right kind of Breathable paint to allow the damp to escape, this is extremely expensive. Also it is CRITICAL that it is properly cleaned before painting. Why spend thousands of pounds painting it when cleaning can make it look brand new, and is a fraction of the cost of painting? 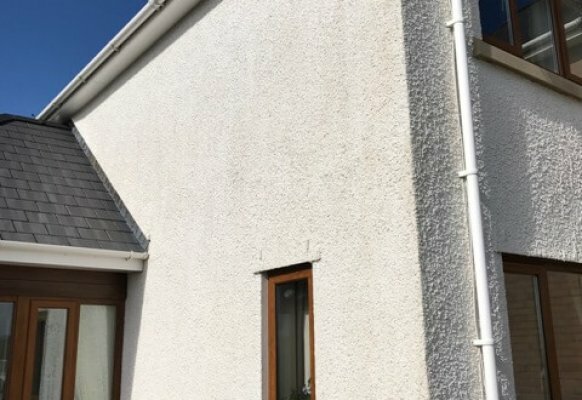 Painted K Rend will still need periodic cleaning as algae etc will grow on that also, it will also require re painting at some point, so painting the render at best adds a large amount of unnecessary maintenance cost. At worst if done incorrectly the paint will fail making the property look extremely tatty and there is no easy way to rectify this, the render may need to be hacked back and re installed to fix the problem. A breathable sealer can be useful to keep the surface dryer in elevations that catch the prevailing weather, however periodic cleaning will still be required. What Type of Render is on my property? Most render used on new buildings now is coloured through render as it is quick to install and does away with the need to paint. K rend is the UK’s largest manufacturer of through coloured silicone render however there are other manufacturers such as Weber, Parex, Sto and Monocouche. These vary slightly in appearance and texture however the cleaning and maintenance methods are very similar for all of these coloured render products. 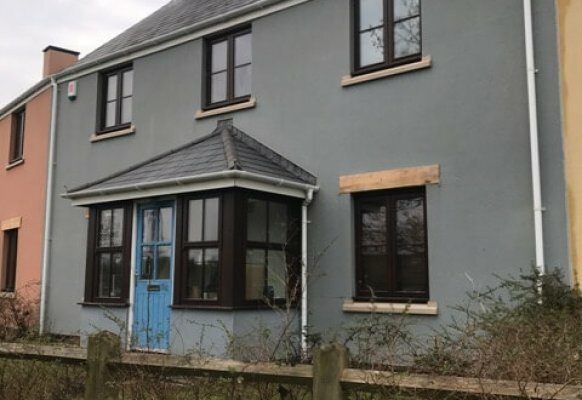 Roughcast render is also often coloured but is usually an acrylic base coating with various sized grains added for texture, this is less pourus and therefore easier to clean and less prone to staining than scratch coat silicone render. K Rend can be easily recognised by the slight sparkle in the finish, the others are slightly more difficult to tell apart. You can easily mistake coloured through render for painted Stucco render but painting it without need could be a very costly mistake. If you aren’t sure how to look after the walls of your property we are happy to take a look to give you some advice, free of charge. We can clean render in all of South Wales, West Wales and Mid Wales. 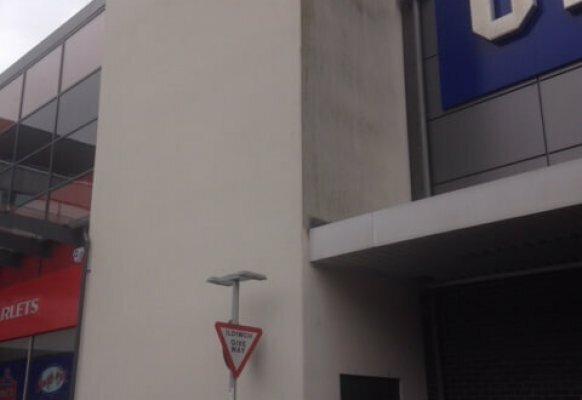 We have completed render cleaning projects in Swansea, Llanelli, Carmarthen, Ferryside, Kidwelly, Cross Hands, Burry Port, Trimsaren, Saint Clears, Gowerton, Loughor, Pontardawe, Neath, Llandeilo and Aberystwyth.